It’s the thirteenth of the month and the hottest time of the year, so we expected the large-nostrilled wraiths in the FirstNerve newsroom to deliver a bumper crop of ISDP material. We were not disappointed. From the extensive comments on Bakersfield.com, it appears that Dr. Kotarac was well-liked in the community and by her patients. A local reporter found that she was in debt and had substantial state and IRS tax liens; her home had been foreclosed on. Could it have been suicide? Unlikely—physicians have knowledge of and access to more effective methods. A strange episode, but not unique. In February 2009, ISDP brought you the case of a homeless guy who got stuck and died in the chimney of a home in Fontana, California. It was an active ISDP month elsewhere in the Central Valley. A couple of hours up Highway 99 in Merced, police found the body of a 63-year old woman in an apartment on August 14 after neighbors called them to report a foul odor. She had been dead several days; foul play is suspected. On September 3 in Fresno, about halfway between Bakersfield and Merced, police responding to a call about “a foul odor” found “a decomposing body in a pick-up truck” parked at a Motel 6. Officers were called out to Jefferson Heights Apartments just before 11 p.m. on reports of a foul odor. Soon after arriving on the scene, investigators discovered the smell was coming from a parked car. A dead body was found inside. The car belongs to 55-year-old woman who had been reported missing. And in Hillsboro, Texas, a Wal-Mart shopper called police after noticing “a foul odor” from a car in the SuperCenter parking lot. Police found a dead body in the back seat. The deceased may be a local woman recently reported missing. D.C. police say a body was discovered in the trunk of a red vintage convertible that had been towed twice [!] by District officials. The body was discovered Thursday after a worker at the police impound lot smelled a foul odor coming from the trunk. Police opened the trunk and found the body. I’ll go out on a limb and guess ’67 Mustang. What exactly was the point of sealing up the doors? By the time they started smelling they’d be long dead... Did they think they'd *never* be found if no one smelled the bodies? In Columbus, Ohio, the badly decomposed body of a 51-year-old man was found in the second-floor bedroom of his home on the South Side after neighbors noticed “a bad smell” and mail piling up at the residence. In Linden Township, North Carolina, deputies found the badly decomposed body of a man near Billy Joe Drive (!) after residents complained about “a foul odor” coming from the woods. And a wooded area in Jacksonville, Florida was the setting for another outdoors ISDP incident. Someone called police after noticing “a bad smell” wafting from the woods; officers found a badly decomposed body. Its a smell that words can’t even describe. 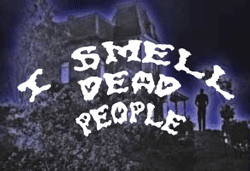 The first time I smelled a decomposed body was 15 years ago when I was living in a apartment. My neighbor had passed away in her apartment. It was during the summer and the smell engulfed the hallway....it was especially bad whenever we walked by her door. Let me tell you...when the property manager opened her apartment the stench made us both violently ill. It was that dang strong. I’d rather smell a dead dog in 100 degree heat than smell a dead body. The smell tends to linger in your nasal passages so it seems like its following you everywhere. A hot summer ISDP just wouldn’t be complete without a incident in New Jersey. This time it was Jersey City, where on August 21 a worker at an auto wrecking yard found a decapitated male body near the Conrail tracks. A worker at the auto wreckers told police he noticed a foul odor in the area where the body was found as early as March. We’ll cut the wrecker dude some slack here: it takes a while for the ripeness of bodily decomposition to rise above background odor levels in the Garden State . . . Finally, there was an extremely rare one-body, two-ISDP event in Graham, North Carolina. On August 11 the body of a 37-year-old woman was discovered by smell; she had been dead five to seven days. Her remains were then left by the funeral home in a parked hearse, where the odor led to a second discovery on August 20. The funeral home is under investigation in connection with the incident.